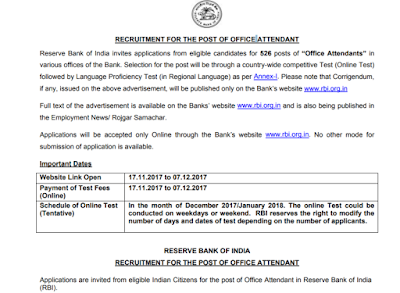 Reserve Bank of India has Invited application form for 526 Office Attendant Post for Various offices of bank. The tentative schedule for the RBI Office Attendant 2017 exam is as follows. Please note down the important dates related to RBI Office Attendant Exam 2017 and make sure to complete the process in time.